Did I finish the Susitna 100 with a smile on my face? Well, based on this photo Geoff took (that I don't remember him taking) - not quite. Actually, I look like a drunk zombie. But I gave that smile my best shot - just like the race. Also, I forgot to mention in yesterday's post that Geoff won the foot division of the Little Su 50K. He came in first with a time of 3:54, just ahead of elite ultra-marathoner Julie Udchachon. I biked the first 25 miles of my race in about that time. He ran 31. Geoff's the champion. I'm not even a contender. But I do feel good about what I did. Really. I did something that as recently as six months ago I would have never imagined myself doing, and I had an incredible journey. Yesterday, when I was mulling over some of the decisions I made on the trail - and the times I posted - Geoff told me, "Only you know what you did out there." He's right. 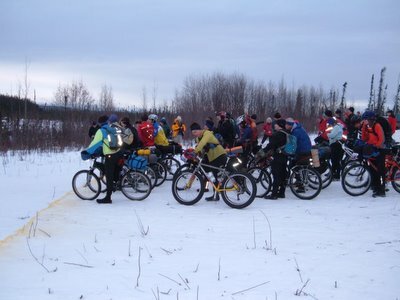 The ideology behind the Susitna 100 is not necessarily to be the fastest runner or best rider. 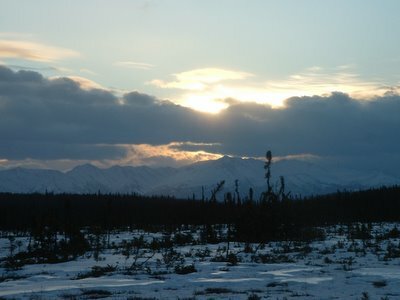 It's about pushing into the Alaska wilderness and making some tracks in the snow - whether they're tire tracks, footprints, or a swerving combination of both. There are some ways I could have been better prepared. I knew it when I lined up next to my fellow racers, most equipped with specially-built snow bikes, wide rims, 3-4" tires and rigid forks. And there I was, straddling my rock hopper. I felt like I was standing at the startling line of the Tour de France with a beach cruiser. In conditions where flotation was everything, that analogy isn't really isn't that far off. But I did the best I could with what I had. And, for its highs and lows, its lonliness, pain, joy, beauty and desolation - the experience was amazing. What was the best moment of my race? It happened as I was cruising across the Susitna River on the first leg of the race. 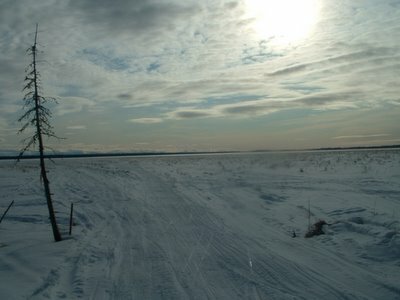 I looked toward Mount Susitna, bathed in golden air and shimmering in the sunlight. Across the river I saw a gray shadow dart into the woods. I convinced myself it was a wolf. I'll never know if it actually was - but I felt absolutely inspired. I don't think it matters what your religion is, or if you even have one - it's in these moments that you see God. And the worst? Ironically, that happened in nearly the same spot, just after I had climbed out of the Susitna River on the incoming stretch. It's a place they call Dismal Swamp, a bog even by winter standards. Rain was coming down hard. I had just spent the last two hours spinning in my lower gears through the deteriorating conditions. When I got to the swamp, my forward motion stopped all together. All I could do was spin a few inches deeper into the soft snow before I fell over. I got off to push but the bike still knifed into the snow, making even the walking tedious. Even my body felt bogged down. I stopped to check my clothing situation and realized my "water resistant" winter coat had given up the fight. My lower layers were dripping, my gloves were dripping, my nose was dripping. I don't think it matters what your religion is, or if you even have one - it's in these moments that you pray for miracles. That's the moment I've agonized over a bit since Sunday morning. I worry I may have given up on the Susitna at that point - walked out because, well, I had to. I knew I would have to deal with some bad conditions, but it seemed like they hit me harder than they hit other bikers still on the trail when the rain hit. It could have been my "skinny tire" bicycle. It could have been my inexperience. For what it's worth, I did try to ride through that last leg. Continually. I would get back on the bike for short stretches. Swerve a bit. Hit a snowbank. Stop. Walk some more. It's hard not to second-guess the decisions you make in the middle of the night. I haven't pulled an all-nighter since I worked at Einstein's Bagels in college. I forgot how precariously unbalanced my mood can become, and I had some amazing swings during the race. One minute I'd be lying with my helmet in a snowbank after one of the many sideways falls I took, on the verge of sobbing and contemplating just staying there, crumpled in the snow. The next I'd be back on my bike, singing along at the top of my lungs to a lovably dated TLC song on 3 a.m. radio ... "I don't want no scrub ... Scrub is a guy that can't get no love from me." Just about every emotion I had was terribly exaggerated. But through all that, I forced myself to keep some perspective. I thought about other moments on my bike that took me to the edge of my breaking point, and how I got through them. I thought about all the people back home - and across the world - that might be cheering me on, even at 3 a.m. I asked myself if I'd rather be pushing my bike through the dark Alaska wilderness or baking bagels in some lonely, starchy kitchen. And I realized that there were some people beneath the orange glow of Anchorage city lights on the distant horizon that had it even worse than me. Would I do it again? In a heartbeat. I can overanalyze my performance until my fingers hurt, but the truth is, what I did was go out for incredibly beautiful - incredibly long - bike ride. That's all. Anyone could do the Susitna 100, but the real joy of it is it takes you to places so few see. It takes you to the edge of the brutal, lonely wilderness and it makes you look deep inside yourself. You have to ask yourself some hard questions. You have to get a grip on your limitations. And, when things are really looking bad, sometimes you have to sing some bad '90s pop music just to get through it. What a great way to be inagurated into the Alaska lifestyle. Great post, Jill, and congratulations on finishing the course! You did great! Congratulations from Boston. An incredible achievement! Great job Jill. An insoiration to all of us. "I felt like I was standing at the startling line of the Tour de France with a beach cruiser."LOL! Nicely done, Jill. You are one tough cookie. Awesome. That's all I can say. . . Awesome. You haven't mentioned the frigid cold once since you started posting about the race - that can only mean the cold must have been the easy part. Great Job from Chicagoland. We can't wait to see what you have in mind for your blog now. Excellent job - I can't even imagine braving those weather conditions and biking over snow for that incredible distance. 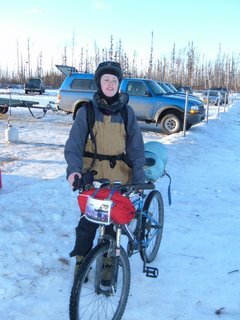 You inspired me yesterday when I thought it was too cold for a 25 min each way bike ride, I'm thinking if Jill can do the Susitna 100 I can surely bundle up to go shopping. Curiousity question - was it 24 sleepless hours, or did you get a chance to power nap somewhere on the route? Awesome job! and an excellent review write up. Great race report and great pictures. Your accomplishment makes any race down here in the lower 48 pale in comparison. Congrats! You finished, and that's all you need. And a damn fine writer too! Agreed. Great work, Jill. Keep writing and riding, eh? Seems like a race in Alaska in February you wouldn't have to worry about rain - ugh, how miserable. 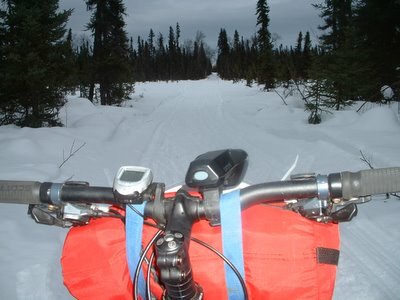 let me phrase it more definitively...you finished a 100 mile bike race, in February, in the Alaskan wilderness. You rock! ...Moments you pray for a miracle. Great way to put words to the experience. A great ride and experience ! I am impressed with your effort and training ! You have a free pass into the Soggy Bottom 100.
you have a spot reserved. What a great story. What great photos. Congrats! Congratulations on finishing. You had to tough it out in horrible condtions, but you made it. You are the best! You're a hero, Jill. Thanks for blogging this. Well done! That is some accomplishment, as I can only imagine. Nice write-up. It's been great reading about your training and the events leading up to the event. Jill, great write up. Anyone who has done a long distance race can relate with this post and the pain and suffering that went along with the ride. Isn't funny how you trudge through a ride like this thinking to yourself, "why did I do this", then when the race is over you are ready to do it all over again. Again, great job! Nice post Jill, and great job - congratulations. WoW! Great post and great job. 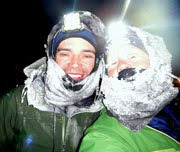 Here I am in Utah complaining about the weather and you are in Alaska doing 100 milers. Amazing. I just had to add my congrats from Vermont. Good Job! Jill congrats. You got some serious mojo goin. Getting through the swamp didn't kill you and you know what that means... You're a champ. Keep on keepin on and happy trails. -a.t.
Amazing job! You're write up is very inspiring. 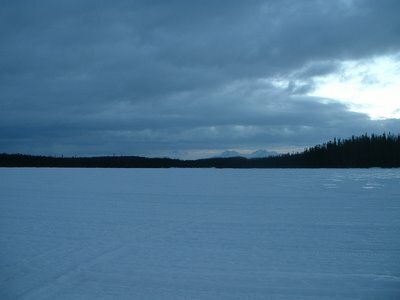 I hope I can make it up to Alaska for the Susitna or the Iditarod next year. Nice blog btw :) Keep up the good writing.